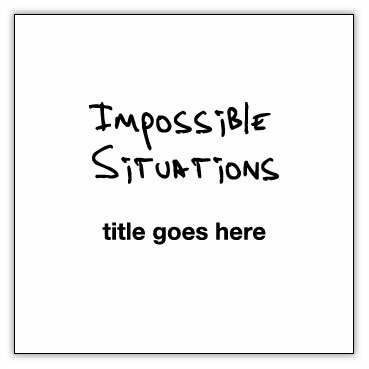 Impossible Situations » Blog Archive » Album update! Maybe the timing isn’t great, but I guess that was never my strongest point… My band Only Seven Left really seems to hit if off big time, so that takes a lot of energy. But I try to find some time to finish the Impossible Situations album once in a while. Just because it’s such a big personal project that has all my heart in it, I would really love to see this done. I’ll find time, for example next week, when we will be finishing the mix in Graveland Studio, ‘s-Graveland. And! I’m working on the album artwork. Not alone, but with some very talented designers/photographers/artists I asked to make something. Every artist will create a piece for one song. Among them are names like Joost Vandebrug, Floor de Goede, James Spencer, Ype Driessen and Chuck Groenink. I will reveal the other names later and give them a proper introduction. I’m really stoked all those amazing creative people are willing to cooperate and I’m sure it will be beautiful. Do I dare to name a release date yet? Yeah, like three years ago. No seriously, don’t pin me down on it, but I think August is doable. Can’t wait, can you?